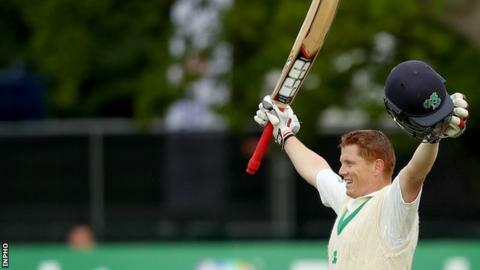 Kevin O'Brien hit an unbeaten 118 to become Ireland's maiden Test centurion as the hosts fought back against Pakistan on day four in Malahide. Ireland, following on, began the day 116 runs behind Pakistan but with all 10 second-innings wickets in hand. When they slipped to 127-5, a heavy defeat seemed inevitable. However, O'Brien shared a 114-run seventh-wicket partnership with Stuart Thompson as Ireland built a lead of 139 ahead of the final day. Pakistan left-armer Mohammad Amir was the pick of the visitors' bowling attack, claiming his 100th Test wicket on his way to figures of 3-57. Ireland lost Ed Joyce early on the fourth morning when he was run out on 43 by Faheem Ashraf's direct-hit. Number three Andrew Balbirnie fell for two in the next over, again falling lbw to Abbas, as the hosts' top order looked to be in danger of swiftly collapsing once more. Both Niall O'Brien and William Porterfield should have been run out before Pakistan captain Sarfraz Ahmed finally turned to Amir. The left-armer uprooted O'Brien's off and middle stumps with a full delivery before Porterfield edged behind to Sarfraz off the same bowler, leaving the hosts 57 behind Pakistan at lunch on 123-4. Abbas had another lbw appeal go in his favour to send Paul Stirling back to the pavilion after lunch but Kevin O'Brien and Gary Wilson continued to bring the hosts closer to ensuring Pakistan would have to bat again. However that partnership was broken up, predictably by Amir, who came back into the attack and claimed his 100th Test wicket when Wilson edged to first slip. Amir nearly found Stuart Thompson's edge too with the very next ball but the Irish number eight quickly settled. The hosts moved ahead in the contest for the first time courtesy of O'Brien's edged four which took Ireland's most experienced cricketer onto 48. Pakistan took the new ball prior to tea, with Ireland owning a lead of 13, hoping to wrap up their innings. But the runs were flowing as Kevin O'Brien and Thompson remained in the middle at the end of the second session, increasing their team's advantage to 32 thanks to a partnership worth 55. Thompson reached his half-century with a fine hook for four but was bowled shortly after by Shadab. Tyrone Kane came out to the crease and defended stoically as O'Brien reach his historic century in the last hour of play. Crucially for Ireland he finished the day not out despite nearly playing on to Abbas in the day's final over. Ireland's lead of 139 has now set up an intriguing final day in Malahide.